Aviatak was brought to my attention by a C64 scener on the forum, who kindly submitted the scan of the game in question. 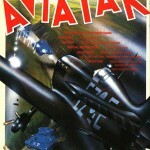 Publicised with a full page advert back in a Dec 1984 issue of Personal Computer Gamer, Aviatak was promoted as a All Action Combat Game, where you had to destroy enemy forces in low level attack, destroying fighters, tanks and avoding anti-aircraft fire, trees and hills. All of this, and then returning to base afterwards. The game was by a relatively unknown company called “Slogger”, and I can’t seem to find too much out about the company at the moment. The game itself could be predicted as a vertical scroller SEU, though more information is needed on this obscure title. Information is currently very vague, and only hangs on the advert which was published.